Künker presents a new auction format: Following the traditional gallery auction, additional lots will be auctioned off via internet only. You can look at it as a combination of traditional gallery auctions and modern internet auctions. eLive Premium auctions, just as gallery auctions, will have a catalogue in order view and read about the lots. But the auction itself will take place online. The virtual auctioneer calls out the lot numbers. An item called will be ready to bid on until no bidder increases his or her bids. After calling out the final bid three times, the virtual auctioneer will knock down the lot for the highest bidder. Künker doesn’t have time limits or automated bidding programs. Every bidder has a fair chance to buy his or her piece of choice to a price that suits his or her orientation. You can also send in written bidding sheets to bid on eLive Premium Auction items. But please notice, that we are not able to process “alternative bids” or bid featuring an overall limit. No. 1173: Germany / Prussia. Friedrich II, 1740-1786. 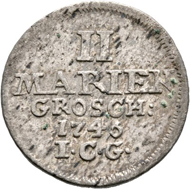 2 mariengroschen 1746, ICG, Esens. Old. 244. Extremely rare. Very fine to extremely fine. Estimate: 1,500 euros. Browsing the eLive Premium Auction catalogue, it is evident that this first eLive Premium auction will be a full success. 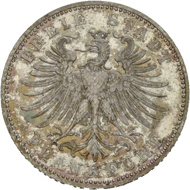 It contains everything a collector can hope for: a comprehensive offering of most interesting coins from pre-1871 Germany, Europe and overseas, as well as an abundant Russian collection containing many rarities and medals. No. 1360: Germany / Frankfurt. 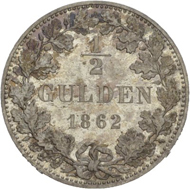 1/2 gulden 1862. AKS 17. Rare. Proof. Estimate: 600 euros. But let’s start at the beginning: The numismatic voyage will take you from Aachen to Wuppertal through all of pre-1871 Germany in 1005 lots. Collectors will not only find talers and gulden, but mostly the more rare fractions, which in excellent condition are even harder to come by. Many of the pieces stem from the Ernst Otto Horn collection. The estimates range from the two-digit to the four-digit area. No. 1395: Germany / Hersfeld. 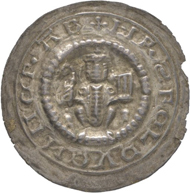 Heinrich IV, 1264/1267. Bracteate, Arnstadt. Very rare. Estimate: 600 euros. Specifically worth mentioning are the many medieval bracteates which will be called out. 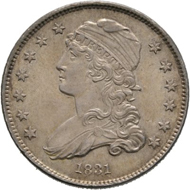 Among them are rare pieces and coins in extraordinary condition. No. 1400: Germany / Hesse. Friedrich II, 1760-1785. 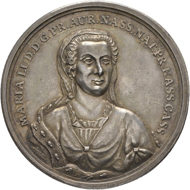 Silver medal, 1765, displaying his portrait by Jacob Abram, on the death of his aunt Maria Louise. Schütz 1538. Extremely fine. Estimate: 600 euros. No. 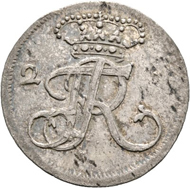 1823: Germany / Saxony-Weimar. Carl August, 1775-1828. 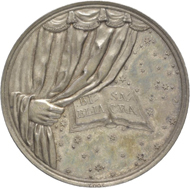 Silver medal 1817, by D. F. Loos, on the 300th Jubilee of the Reformation. Brozatus 1245. Extremely fine to brilliant uncirculated. Estimate: 100 euros. A very interesting and multifaceted medal collection concerning the Reformation, especially its Jubilees, will be going over the auction block. No. 2386: USA. 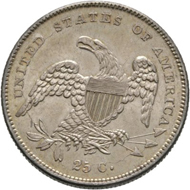 25 cents (1/4 dollar), 1831, Philadelphia. Yeo. 2015, S. 166. Almost brilliant uncirculated. Estimate: 1,500 euros. Among the 400 coins and medals from Europe and Overseas, mostly small denominations from the medieval period to the 19th century can be found. The major focus points are Denmark, France, Great Britain, Norway, Switzerland, and the United States. No. 3063: Russia. 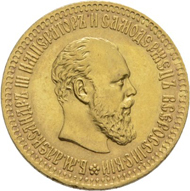 Alexander III, 1881-1894. 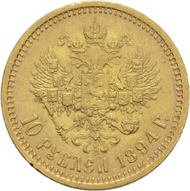 10 ruble 1894, St. Petersburg. Fb. 167. Only 1.007 specimens minted. Extremely fine. Estimate: 3,000 euros. 786 lots of Russian coins and medals complete the catalogue. Here, too, many rare fractions in great conditions are to be found, just as numerous rubles. No. 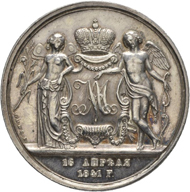 2973: Russia, Nikolaus I, 1825-1855. 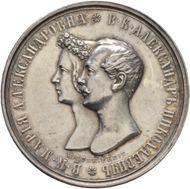 Silver medal of one ruble, 1841, by H. Gube, on the marriage of his son, Alexander II, to Maria of Hesse-Darmstadt. Diakov 563.2. Very rare. Extremely fine. Estimate: 3,000 euros. 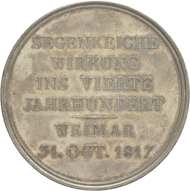 The connoisseur will be happy to discover a plentitude of historical medals made from different materials and in partially exceptional conditions. No. 2658: Russia. 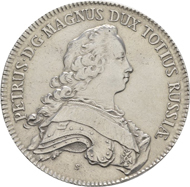 Peter III, 1762. 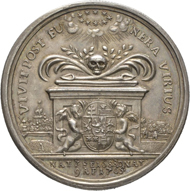 Albertustaler 1753, Mannheim. 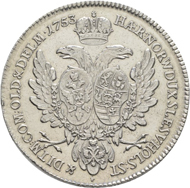 Minted for Schleswig-Holstein-Gottorp as Duke Karl Peter Ulrich, 1739-1762. Diakov 46. Very rare. Very fine to extremely fine. Estimate: 2,000 euros. These medals display the great craftsmanship of the die cutters of the Czars and Czarinas. The catalogues may be ordered at Künker, Nobbenburgerstr. 4a, 49 076 Osnabrück; Phone: 0541 / 96 20 20; Fax: 0541 / 96 20 222; oder via e-mail. Four weeks prior to auction you will also find all auction lots online under www.kuenker.de and www.eLive-Auction.de. In order to take part in auction from home or wherever you will be, please use your personal myKünker account. Should you not be registered yet, please do so in a timely manner before the auction commences.